the newest build of “Ashampoo WinOptimizer 11”. 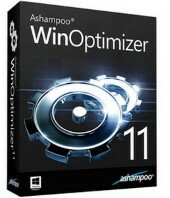 Ashampoo WinOptimizer 11 is the ultimate virtual service technician to clean, optimize and protect your PC. Use Ashampoo WinOptimizer 10 to make your PC faster and more responsive, clean and declutter your system, fix and repair common Windows errors and improve system stability, achieve and maintain peak performance. Also you can protect your privacy and safeguard or remove sensitive data. Computer maintenance is essential but time-consuming. Like any other machine, computers require maintenance at regular intervals to ensure smooth operation. Relying on built-in facilities alone, though possible, is a daunting task that requires intricate knowledge as well as constant efforts to keep up to speed with technical developments. Don’t let background tasks take time away from you! Let Ashampoo WinOptimizer 10 handle system complexity while you focus on what computers were made for – to get your work done!